Aside from today, I haven't seen Spring Blossom Green in what seems like forever considering it was one of the most common patterns I came across. Today's stayed on the shelf. Nice & dishwashered. 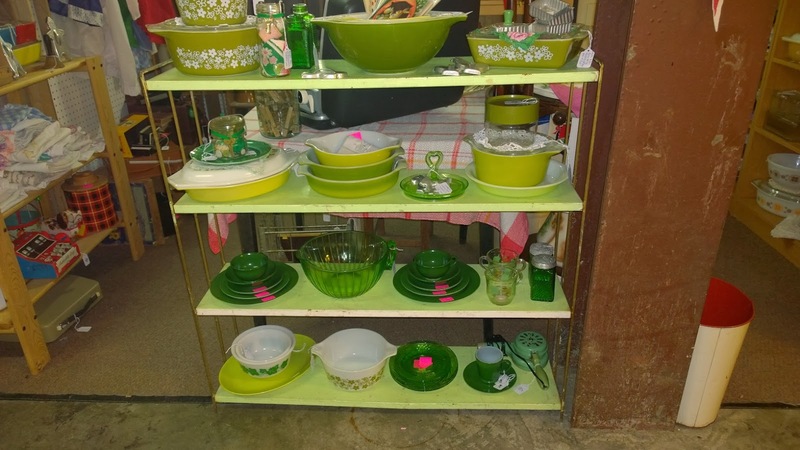 WOW... you have all the lovely green pieces I want (pyrex and such) in lovely spring blosson green, verdi and such. I want to go BACK to using the vintage pyrex and such everyday in my retro kitchen. I adore the greens! So love your booth - wish you were here in my neck of the world (SW GA). So would love it all! Lots of great green in your booth! Thanks for linking up to TTF! Love how you have all the green displayed...looks great! Nuts to more snow! I'm so over it! I hope you were able to get there. How pretty! I hope you don't get any snow.